Fish – I seasoned it with salt pepper, lemon and rosemary, lightly floured it and pan fried it in some oil. Swiss chard – I repeated the creamy pasta sauce with bacon recipe from last week. Original recipe here. The watercress was eaten with some of the leftover salad ingredients from last week too. At some point I added some of the fish and it made for a delicious fish salad. I really like the peppery taste of watercress. The zucchini, peppers and onions were cooked in butter and brown sugar, just like the squash and onions recipe I did before. 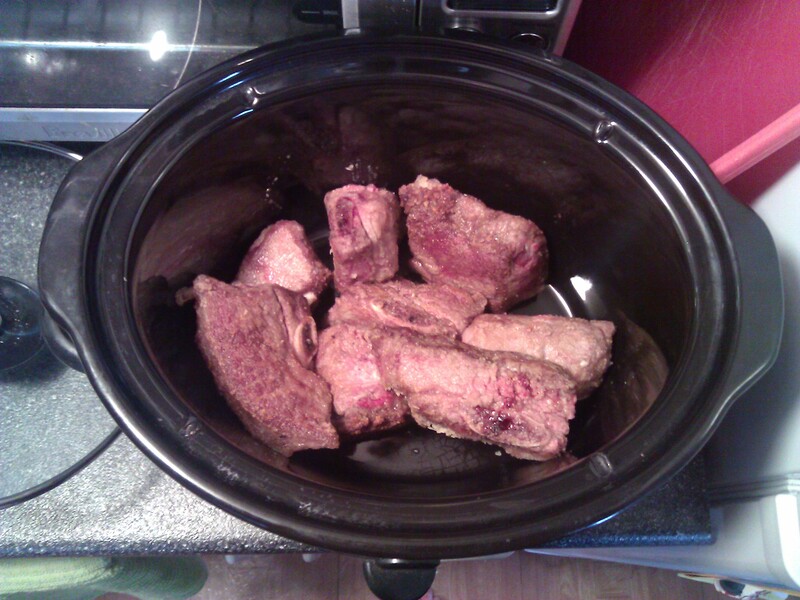 Now, for the short ribs… My oh my, the short ribs. I have no idea what Jeff did to them, but they were amazing… Here are some pictures he can describe later on. 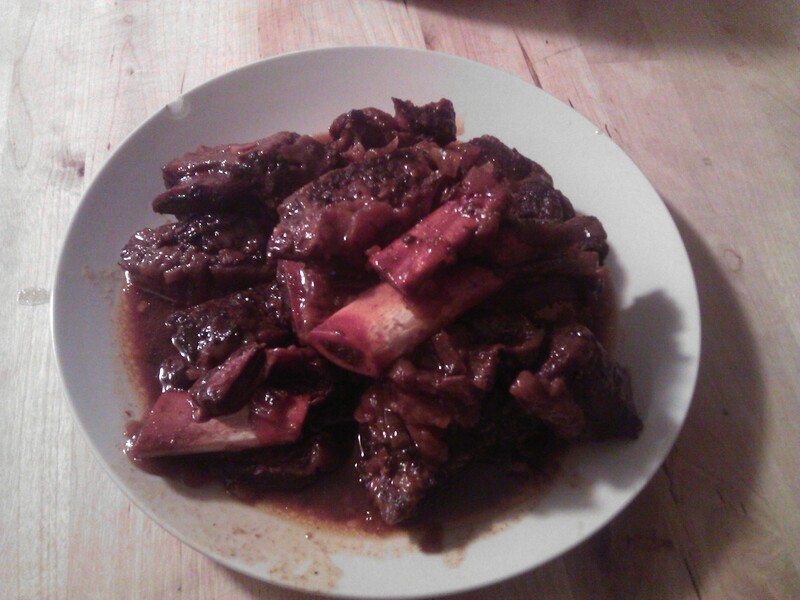 J – I love short ribs falling off the bone, but it can be difficult to make them in a tiny apartment kitchen like ours – unless you have an apartment chef’s best friend, the slow cooker. 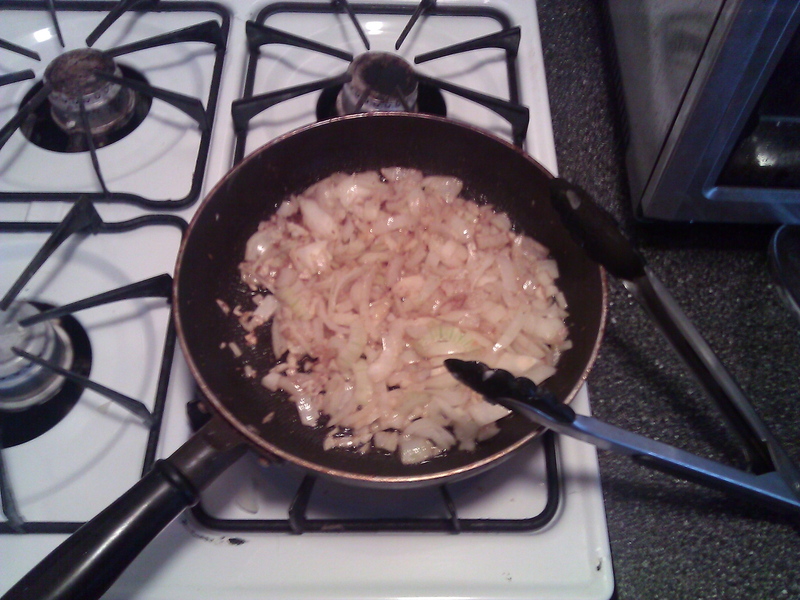 Then, in a separate skillet, I browned several cloves of garlic and two small (but spicy) onions with about a tablespoon of olive oil – not too much, you’ll be mixing in the drippings from browning the ribs. 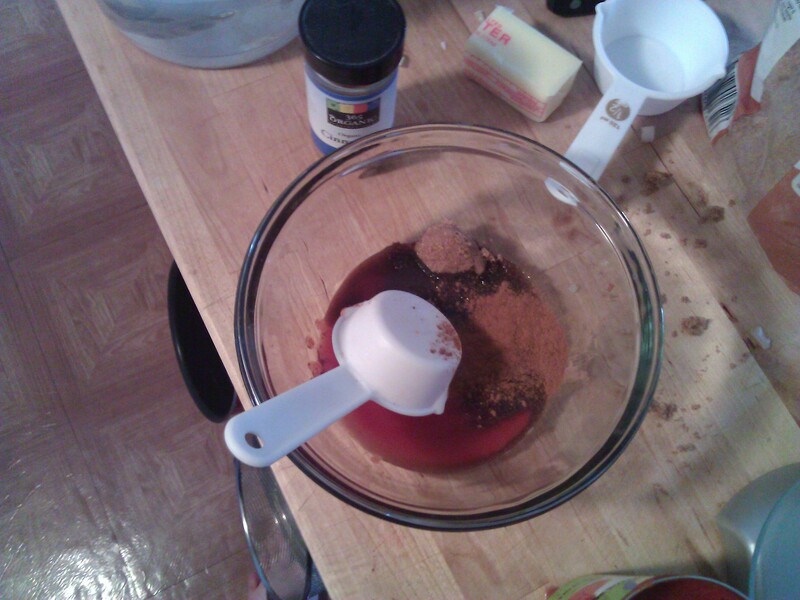 Instead of using chili sauce or barbecue sauce, I just made my own: red wine vinegar, tomato sauce, brown sugar, cumin, cinnamon, and allspice whisked together. 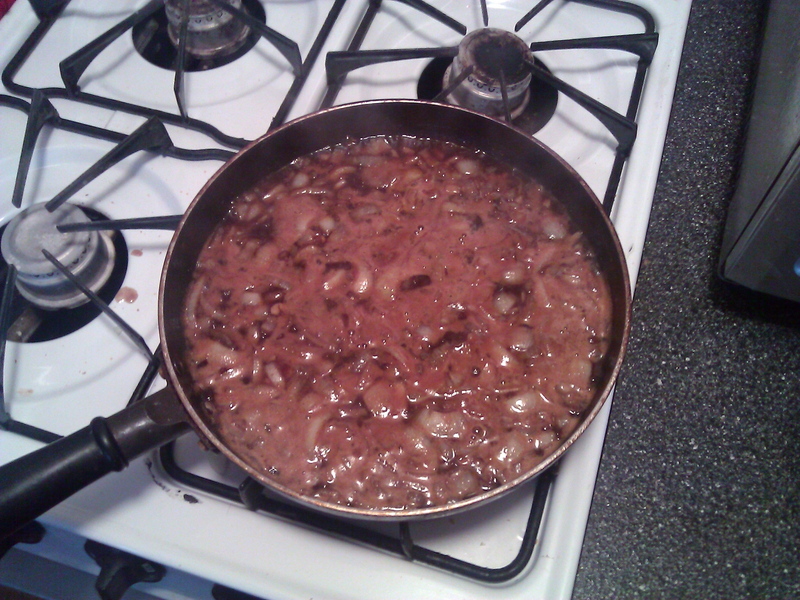 I added this and chicken broth to the sauteed onions and garlic and brought it to a simmer. After about five minutes (just to reduce it a hair and let it simmer off) all of it went in the slow cooker on low for about 6-8 hours, or until the meat is coming off the bone. Yum! I used the sauce left over in the slow cooker to make a barbecue-like sauce – just thicken with flour and heat up in a pan. You’ll have WAY more than you need but that’s ok – it’s delicious anyway. 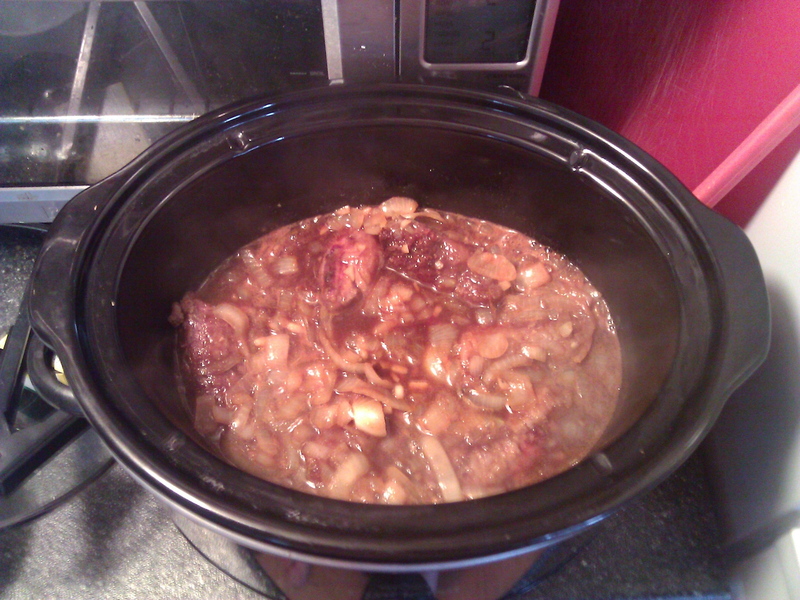 As always, while anything is in the slow cooker periodically skim the fat that rises to the top and enjoy! I – Doesn’t that look delicious? Well, it was… I’m hoping there will be some kind of ribs in a soon to be delivered basket so we can do this again, this was sooo good.